When Bobbi Cordano officially took office as Gallaudet University's eleventh president on January 1, 2016, she made it clear that she wasn’t starting “my presidency,” but “our presidency.” Her administration has been marked by new initiatives, projects, plans, and developments. Priorities include GU's bilingual mission, diversity, student experience, GU's infrastructure, academic and community vitality, and financial management. In DEAF LIFE's exclusive interview, she details these priorities—a new grant to improve public-health professionals' communication with Deaf patients, a documentary project on Deaf New Yorkers, a summer project to increase Deafblind people's participation in theater onstage and in the audience, Real Time Text, patented at GU, and the National Science Foundation Science of Learning Center, Visual Language and Visual Learning (VL2), the Motion Light Lab (ML2), Petitto Brain and Language Laboratory for Neuroimaging (BL2), which is piloting the Robot Avatar thermal-Enhanced (RAVE) language-learning tool. In March 2018, the Deaf President Now! movement marks its 30th anniversary. GU will be celebrating. And in April 2018, GU unveils the new Maguire Welcome Center, thanks to the generosity of the Maguire Foundation, James and Frances Maguire. 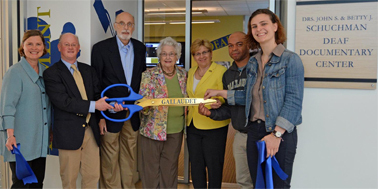 The Welcome Center will be located in the current Visitors Center in Edward Miner Gallaudet Building (EMG). Work continues of the redevelopment of the Sixth Street Corridor adjacent to the Kendall Green campus. Other improvements: Revising the General Studies Requirement curriculum, a new tinker lab in the Washburn Arts Building, student housing and library enhancements. Ryan Maliszewski has been hired to direct the Gallaudet Innovation and Entrepreneurship Institute (GIEI). Elavie Ndura is GU's new Chief Diversity Officer, working with a new Diversity Strategy Team.